FORUM readers should know about your products and/or services. 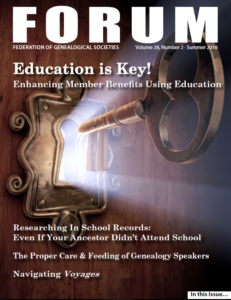 The Federation of Genealogical Societies (FGS) publishes FORUM, a quarterly electronic magazine providing current information on subjects of interest to genealogists. FORUM readers include the leadership of member societies and individual subscribers. Advertising copy that exceeds the above measurements may be proportionately reduced to fit at the discretion of the publisher. Files should be submitted in JPEG, TIFF, or PDF format in color. FGS reserves the right to refuse any advertisement. All advertising must be prepaid. To earn multiple issue discount, all insertions must be prepaid with the first ad. Send any questions to advertising@fgs.org.